Confounded by the various theories on weight loss? Let us help you sift the stuff from the fluff. Why Green Tea: Green tea has been used in China for about 4,000 years and is extremely beneficial for patients with cancer, cardiovascular disease, high cholesterol, impaired immune function, infection, rheumatoid arthritis, etc. It even combats the side-effects of smoking, to some extent. In fact, most Japanese men are smokers but the incidence of heart problems among them is low due to the high consumption of green tea. Protein Pointer: Protein is necessary for growth, development and tissue repair. The protein we eat is broken down into amino acids. Some of these are "essential amino acids," so named because the body can't make them and they must be obtained through food. We can't store amino acids, so we need to replenish them daily through our diet. The amount of protein we need every day depends, in part, on weight and physical activity. Some people need to restrict their protein intake because of kidney dysfunction, bone issues like arthritis, metabolic disorder or an immune disorder. For the average healthy adult, the Recommended Dietary Allowance (RDA) is 0.8 gm of protein per kg of body weight per day. The RDA is higher during childhood, pregnancy, lactation, and recovery from an illness, trauma or major surgery. Ideally, 10-30% of calories should come from protein. Most animal sources of protein contain all the essential amino acids, but many vegetable sources do not. To get the full range of essential amino acids, vegetarians need to eat a variety of protein-rich foods every day. Animal and vegetable proteins have roughly the same effects but it's important to pay attention to other aspects of our food choices. For example, steak is a great source of protein, but it's also a source of saturated fat, whereas whole grains are good protein sources as well as excellent sources of fibre. Plant sources of protein, such as beans, nuts, and grains, help us bypass unhealthy fats predominant in animal sources. Enjoying a wide variety of vegetables and eating beans and grains helps you get a full complement of amino acids over the course of a week. Abhinav Tripathi, 39, has a paunch. For the last four years, this legal consultant has been only nibbling on food. Friends and relatives never see him eating unhealthy food. Colleagues are confounded at his no-lunch-but-will-take-a-bite-from-you attitude. So Tripathi, hoping to lose weight, is confused why he is still gaining weight. 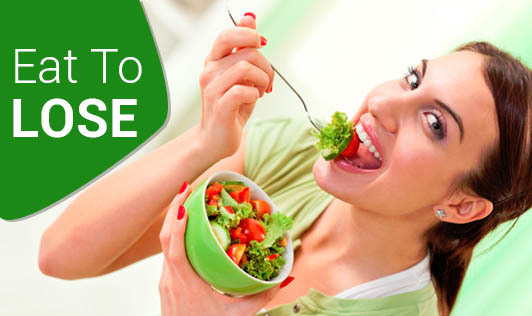 "Don't all dieticians and nutritionists say you have to have five or six small meals every day? Or nibble?" His frustration mirrors the angst of hundreds of working professionals trying to lose weight, doing all the right things, and not managing to move a single gram. So what's Tripathi doing wrong? Eating Less Than Required: Our bodies need a minimum number of calories and not getting enough will lower our basal metabolic rate (BMR)-the rate at which our body burns calories. Hence, if your BMR is 1,600, you need 1,600 calories at rest (this does not include daily activities or exercise) to maintain your body weight. Otherwise your body will go into energy conservation mode and your metabolic rate will drop. This means that if you consume 1,200 calories and your metabolic rate drops to 1,100, you will not lose weight. Eating three meals of 500 calories plus two snacks of 300 calories is ideal for a middle-aged man 5 ft 10 inches tall and weighing 85 kg to lose weight. Eating Less Fibre: A bite here, a few there. If that's your eating style, you're getting almost no roughage and fibre. Fibre flushes fat and deposits in the blood out of the system (deposits can be sugar, cholesterol, lipids, etc.) So if you eat more fibre, you consume fewer calories and flush out more fats. Fruits, whole grains and fresh vegetables all contain fibre. These should constitute 80% of your diet. Eating Late: If you're overweight, the easiest way to lose weight is to not eat post 8 pm. Doing this five days a week can lead to reasonable weight loss without making any other effort. For maximum effectiveness, your last meal should be a wholesome mixed vegetable soup and a whole-wheat toast, or a large salad and a whole-wheat toast. And this should be finished by 8 pm. Not Exercising: Yes, it's a bummer. But it's the only way to maintain weight and to stay young. Exercising 45 minutes, three to four days a week, reduces internal inflammation and keeps diseases like cardiovascular diseases, diabetes, arthritis and hypertension at bay. Hence, apart from helping you lose and maintain weight, exercise is your anti-aging pill. And did I mention glowing skin and fewer wrinkles, too? Now that you know, move it.